Just a few weeks ago FactSet was reporting analysts’ estimates for Q1 2016 EPS were looking to be a 6.9% decline year-over-year. Their latest update now suggests -8.0%, as the deterioration in earnings outlook is becoming the most significant part of the trend. During the first two months of Q1 2016, analysts lowered earnings estimates for companies in the S&P 500 for the quarter. The Q1 bottom-up EPS estimate (which is an aggregation of the estimates for all the companies in the index) dropped by 8.4% (to $26.69 from $29.13) during this period. How significant is an 8.4% decline in the bottom-up EPS estimate during the first two months of a quarter? How does this decrease compare to recent quarters? During the past year (4 quarters), the average decline in the bottom-up EPS estimate during the first two months of a quarter has been 3.8%. During the past five years (20 quarters), the average decline in the bottom-up EPS estimate during the first two months of a quarter has been 2.8%. During the past ten years, (40 quarters), the average decline in the bottom-up EPS estimate during the first two months of a quarter has been 3.6%. Thus, the decline in the bottom-up EPS estimate recorded during the first two months of the first quarter was larger than the 1-year, 5-year, and 10-year averages. In fact, this was the largest percentage decline in the bottom-up EPS estimate over the first two months of a quarter since Q1 2009 (-24.0%). That suggests both the seriousness of the trend and confirmation of what we see in economic accounts well away from the BLS employment figures. 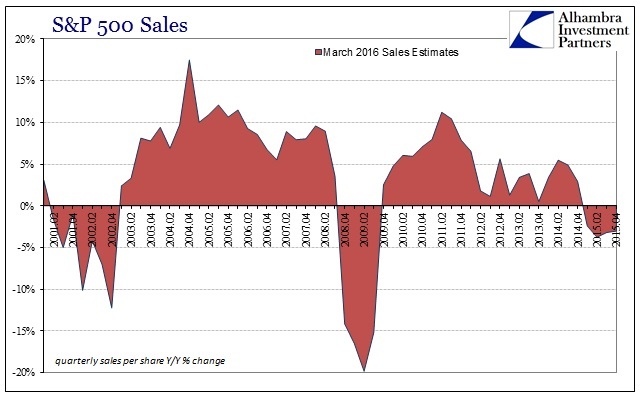 In other words, the “earnings recession” is quite real and it is getting broader and deeper still. In many ways it is already worse than even all that spelled out above as those EPS estimates are operating earnings stripped of the full measure of GAAP charges. S&P, however, provides useful contrast if only limited to the S&P 500 index (meaning the EPS estimates presented below are not translatable to the FactSet estimates noted above). As of March 3, 2016, with 97.8% of the 500 companies having reported for Q4 2015, the index EPS for “as reported earnings” stands at just $18.63. That is the lowest quarterly EPS since Q1 2010.  It is 18.4% less than the $22.83 reported from Q4 2014. Somehow, though, EPS is expected to rise 14% in Q1 2016 according to these analysts even though the rest of the equity compilations are all suggesting deeper contraction. It seems as if analysts are having great difficulties with “one time” charges, the major difference between operating earnings and the GAAP version since operating EPS is currently figured to rise just 3.4% in Q1 2016 – meaning that the current estimated growth in “as reported” EPS is due solely to a lack of clarity about how large those charges excluded from GAAP will actually be. 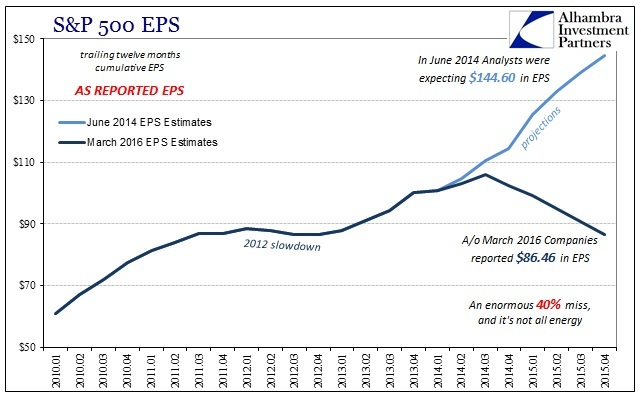 There is a more basic pessimism with even this set of EPS estimates. In June 2014, for example, analysts were predicting that the economy in general and energy sector in particular would just roll forward undisturbed by anything. 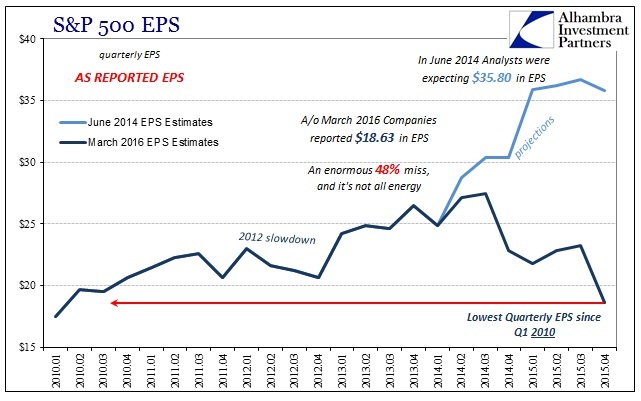 At that time, analysts suggested $35.80 in S&P 500 EPS “as reported” for Q4 2015; missing the actual by nearly half. On a trailing twelve month basis, analysts in June 2014 were expecting $144.60 in “as reported” EPS for 2015 which was instead just $86.46. That leaves the actual PE (none of this “forward PE” which, as you can see, may never actually happen to validate valuations) at an enormous 23 times these EPS figures for an index value of about 2,000. 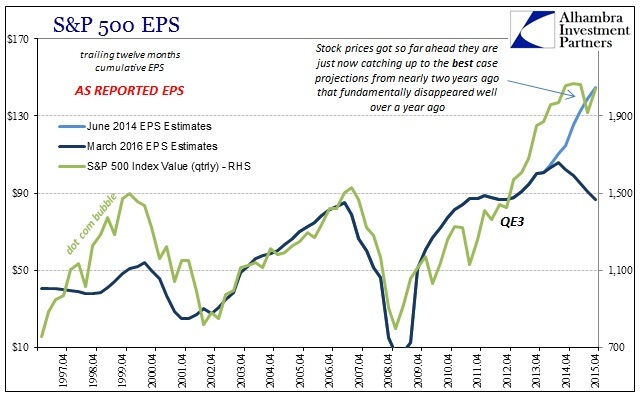 But where the EPS track clearly departed in the middle of 2014 (“rising dollar”) and into highly questionable economic circumstances, it may have seemed as if stocks were catching up to the fundamental deterioration. However, the index and valuations got so far ahead after QE3 that even with essentially no more gains over the past five quarters (and serious liquidations included) in mostly sideways to lower trading, that only brings the index to what earnings might have been under those prevailing June 2014 assumptions. In other words, stocks (S&P 500) even at their lowest point in February were nowhere near actually picking up the underlying fundamental divergence Yellen to recession. All that has been accomplished is that the post-QE3 overenthusiasm has been erased, leaving “markets” still to reckon with fundamental earnings chasm presented by the obvious setback in reported earnings (the recessionary economic showing up in hard dollars rather than the statistical skew of the unemployment rate and Establishment Survey). 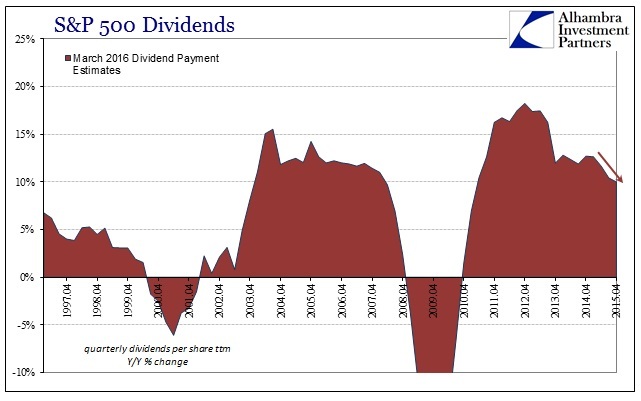 This discrepancy is becoming more than just EPS, too, as sales and now dividends begin to resemble very real and widespread economic difficulties. Across Wall Street, many believe that fears of the U.S. economy falling into recession are overblown. Still, with corporate earnings set to decline for a third straight quarter, companies are showing more signs of strain, and that has dividends under greater pressure. So far this year, fewer companies are raising or initiating dividends than in years past. And, for those companies that are upping their payouts, they’re increasing them by less, according to Howard Silverblatt, senior index analyst at S&P Dow Jones Indices. The economy of Janet Yellen and the unemployment rate/Establishment Survey was the one economists and analysts were modeling in June 2014 just prior to the “unexpected” appearance of financial disruption due to the “rising dollar.” Rather than confirm the health or resilience of the economy as the “strong dollar” once suggested by economists and policymakers, the trend in earnings and really cash flow conforms to the opposite version that looks more like recession than growth. Unfortunately, a broader survey of expectations for the immediate future suggest that this fundamental break is only continuing, leaving the economy in a truly precarious position and the latest stock bubble still to reckon with that full disparity.